Every hunter can attest that there are no certainties on the mission. No one knows who the Messengers are, where monsters come from or why certain people are chosen to be imbued. But now, a new force emerges, a new creed never seen before. Can these strange, distant, isolated people answer the questions on all hunters' lips? Or does their seeming madness only pose more? 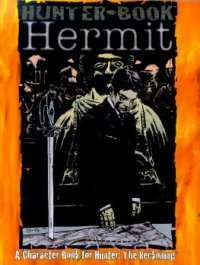 Hunter Book: Hermit is part of a Hunter: The Reckoning series dedicated to the creeds, the character types of the imbued. Hermits are one of the two lost hunter creeds, a group of disenfranchised people who shun monsters - and their own imbued brethren. Learn what it takes to drive these hunters into isolation, even when they know the horrible truths of the World of Darkness.